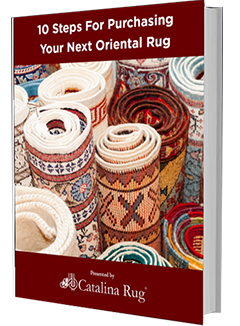 Any oriental rug that is laid down on the floor is susceptible to spills and accidents. 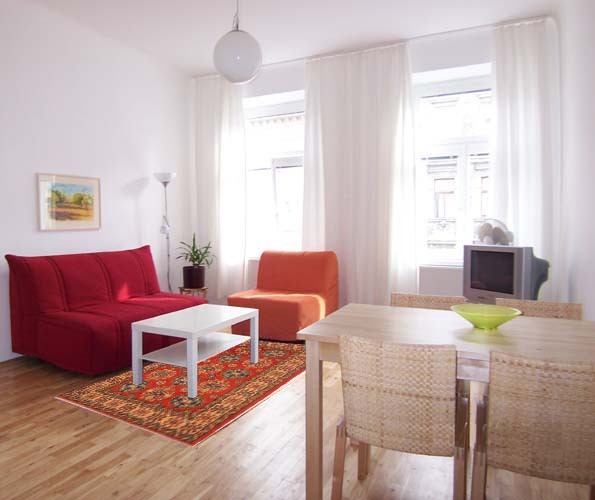 Kids running around could spill fruit juice or soda onto the rug. A guest could knock a glass of red wine and send it crashing onto the rug or your pet could urinate on it. All of these spills can cause your beautiful oriental rug to get stained if you do not do something about it. Luckily, most spills can be taken care of quite easily. For some of the bigger or messier spills, you may need to get your rug professionally cleaned or treated for stain removal but even then, a little First-Aid done at home before taking the rug to the cleaners will help minimize the staining and act as effective damage control. 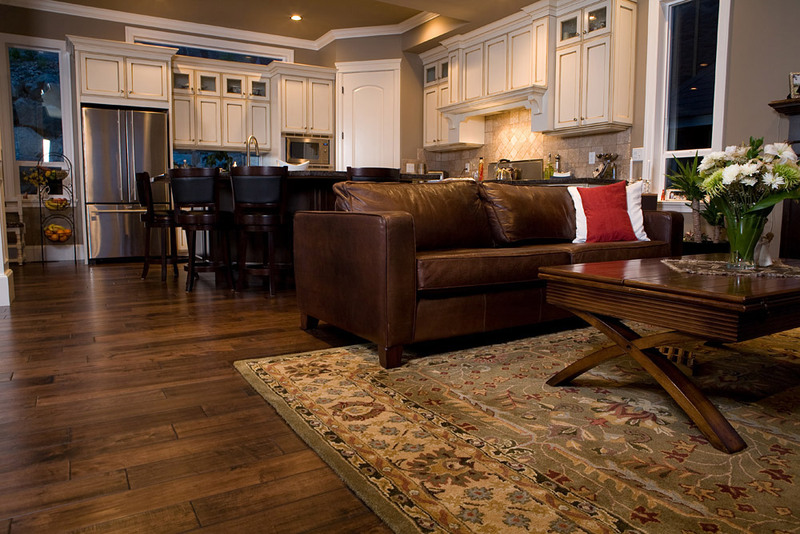 While different stains may require different measures for complete removal without doing any damage to the rug, the basic principles of stain removal are the same and the steps for removal are similar. The main difference lies in the agent used in the stain removal. 1. 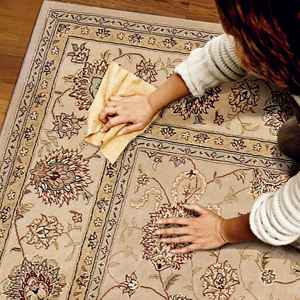 Act Promptly: This is absolutely the most important part of rug stain removal. One of the reasons why some stains just refuse to go away or require extensive removal procedures is because they were not attended to immediately. The problem with this is the longer any stain is allowed to stay on the fabric of the rug, the more stubborn it becomes and the more difficult it is to remove. If any liquid falls onto the rug, immediately blog up the excess liquid using a clean, absorbent towel, paper napkin or any piece of cloth. Always use a white cloth to prevent any accidental color run-off from the absorbing cloth. If any solid falls onto the rug, scoop it up immediately with a clean spoon or spatula and dab with a clean towel to absorb any liquid that may be present or to remove any leftover solid crumbs. 2. Pre-Test Before Using Any Cleaning Material: Before you use any cleaning material directly on the stained area, pre-test it by using it in a more inconspicuous area of the rug such as a corner. This is because some rugs may contain certain dyes that could react to some cleaning materials causing he color to fade or bleed, making it even worse than before. 3. Blot Gently Between Steps: When cleaning certain stains you may have to switch between using different liquids. This could cause excess liquid to accumulate in that area. Blotting between every step will prevent this. You have to be careful never to rub at a stain however. Rubbing a stain aggressively or scrubbing vigorously can send the stains deeper into the pile of the rug and will also abrade the rug fibers. The recommended way to do this is by pressing the cloth down against the rug and holding it for a few minutes. If it is a deeper stain, place a folded towel or thick pad of cloth over the stain and hold it down with some weight. Keep it over the stain for a few minutes till all of the liquid is absorbed. 4. Never Use Bleach On A Persian Rug: It can be tempting to use bleach to remove a stain especially when it is a darker stain such as that left by red wine or coffee. While bleach is actually effective for removing such stains, it will also bleach away the dyes of the fibers, leaving the rug looking dull, faded and patchy. 5. 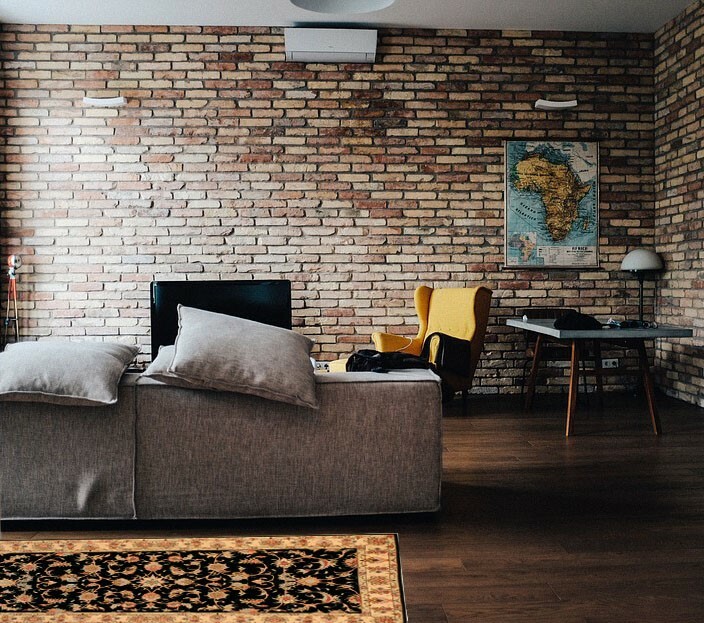 After The Procedure, Dry The Rug As Soon As Possible: You should never leave a rug damp for any longer than absolutely necessary. The fastest way to dry a rug without doing any damage is to leave it under a fan or use a hair dryer for a few minutes. Do not keep it out in the sun as this can fade the rug. 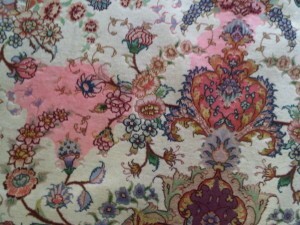 An oriental rug is a major investment but no matter how careful you are, spills can and do happen. Besides having the dos and don’t of stain removal in mind, you can also put together a rug First-Aid Kit. This kit should contain an assortment of materials and equipment that are usually used in stain removal. That way, no matter what has spilled over the rug, you will always have at hand all you need to remove it or at the very least to minimize the damage and you do not have to add to your stress of looking for the right cleaning equipment or cleaning tools. 1. Clean white cloth or any other color cloth that is colorfast. Keep a few strips or cut squares of cloth. Make sure the cloth is absorbent. 2. A large white sponge. 3. A kind of small squirt nozzle or eye dropper to apply the cleaning liquid drop by drop for cleaning small areas. 4. White vinegar solution, which contains white vinegar and water in the ratio of 1:2. This is very effective on all alkaline types of stains. 5. Detergent solution, which contains 1 tsp of neutral detergent powers in ½ pint water. 6. Enzyme detergent, which is the same as the detergent solution but for this you use a detergent that specifically mentions that it contains enzymes. 7. Ammonia solution, which contains 1 tablespoon ammonia in ¾ cup water. This works great for removing juice stains. 8. Dry cleaning fluid such as such as perchlorethylene. If this is unavailable, you can use any kind of oil/grease or paint remover. 9. Oil-free nail polish remover. It is a good idea to label all of the bottles so you know what cleaning solution each one holds. In the next article in this series, we will discuss the removal of different types of stains. 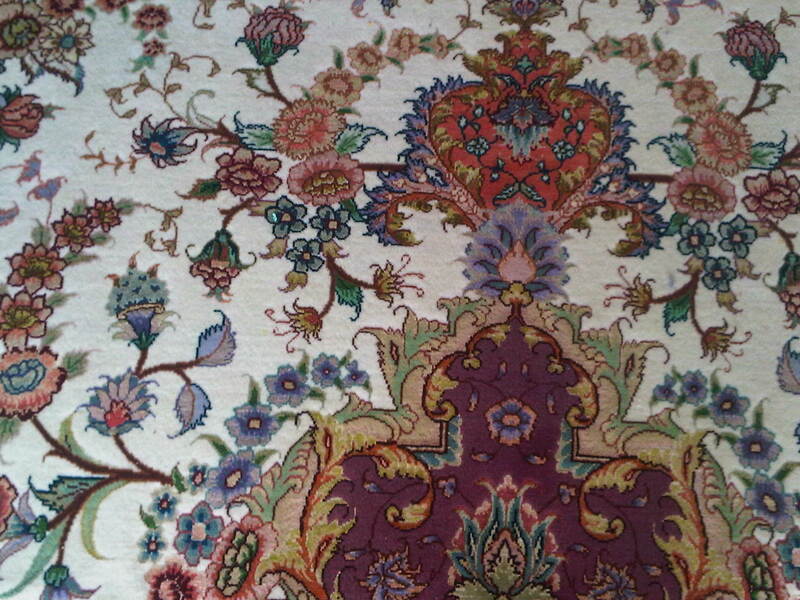 We like to know how do you usually deal with stains on your oriental rug? Have you ever used any of the methods mentioned here. Write to us in the comments below.